Specifications and chemical analysis can be furnished only when we get to know the grades/applications desired by you. Packing Size (kg): 20/25/50/100 kg. 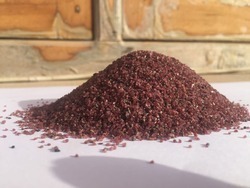 We provide assurance to our customers that a quality approve assortment of Abrasive Garnet Sand is offered by us in bulk at pocket suitable prices. 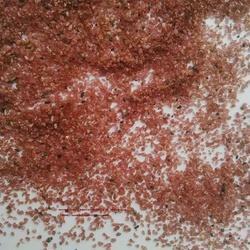 Abrasive Garnet Sand is widely used for water filtration media. We ensure that the clients are satisfied in an appropriate manner with the products of their choice. Global Garnet Sand Pvt. Ltd.
With the help of our team of experienced professionals, we trade and supply premium quality Abrasive Sand. As an acclaimed enterprise of the industry, we are involved in offering premium grade Abrasive Garnet Grains, garnet powder and almandine garnet. The offered grains are acknowledged for their unique chemical properties. We put forward Garnet Sand of superior quality that is popularly used in the manufacture of variety of abrasives.This particular mesh size makes them perfect for sand blasting and water jet cutting and in all mesh sizes.